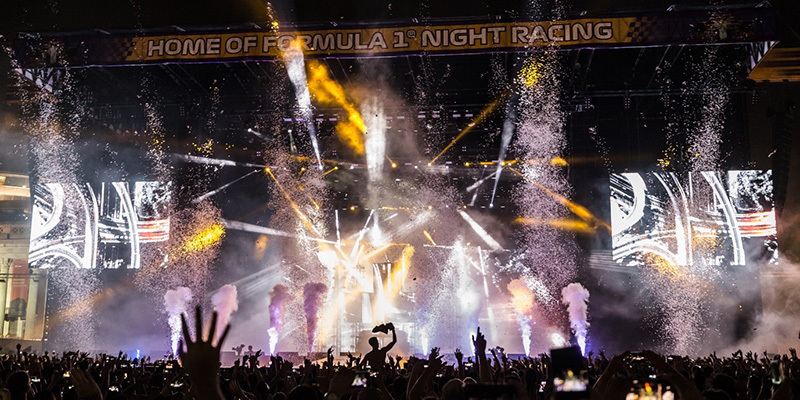 5 March 2019, Singapore – For its twelfth edition, Singapore GP and its affiliate Lushington Entertainments present a stellar entertainment lineup for the Formula 1 night race, including big names Swedish House Mafia, Red Hot Chili Peppers, Cardi B and Hans Zimmer, plus the previously announced acts Muse, Fatboy Slim, Toots and the Maytals as well as Larkin Poe – all taking to the stage at the Formula 1 Singapore Airlines Singapore Grand Prix 2019.
International superstars Swedish House Mafia announced their return at the end of 2018 and will bring their incredible live show to the Padang Stage on 20 September in Zone 4. Swedish House Mafia consisting of Axwell, Steve Angello and Sebastian Ingrosso are the trio behind global hits such as "Don't You Worry Child", "Save The World" and "One (Your Name)". Bringing the party vibes up a notch, fans can dance happy with big beat superstar DJ, Fatboy Slim who will be playing a second show. Known for iconic tracks like "The Rockafeller Skank", "Praise You", "Right Here, Right Now" and "Sunset (Bird of Prey)", Fatboy Slim will hit the stage on 21 September at The Wharf Stage in Zone 1 and 22 September at the Padang Stage in Zone 4. Award-winning composer, Hans Zimmer, will wow with a rousing concert experience this 22 September at The Wharf Stage in Zone 1. Fans will journey through an orchestrated musical set through The World of Hans Zimmer. Hans Zimmer has scored more than 150 projects across all mediums which combined, have grossed more than 28 billion dollars at the worldwide box office. The multi award-winning German composer's works will be presented by a live symphony orchestra, featuring some of Zimmer's best known works from the soundtracks of blockbuster productions including The Lion King, Gladiator, Pirates of the Caribbean, The Dark Knight trilogy, Inception and Interstellar. Patrons will be able to catch these performances at the Marina Bay Street Circuit with a valid ticket for the relevant zones. The artist line-up and performance times are subject to change. General tickets to the Formula 1 Singapore Airlines Singapore Grand Prix 2019 start from S$98 for a single-day ticket and S$268 for a three-day ticket. 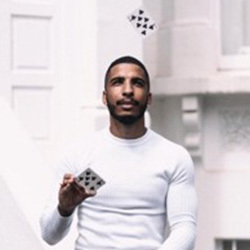 Early-bird ticket specials are available from now till 8 May 2019, offering savings of up to 28% off regular ticket prices. 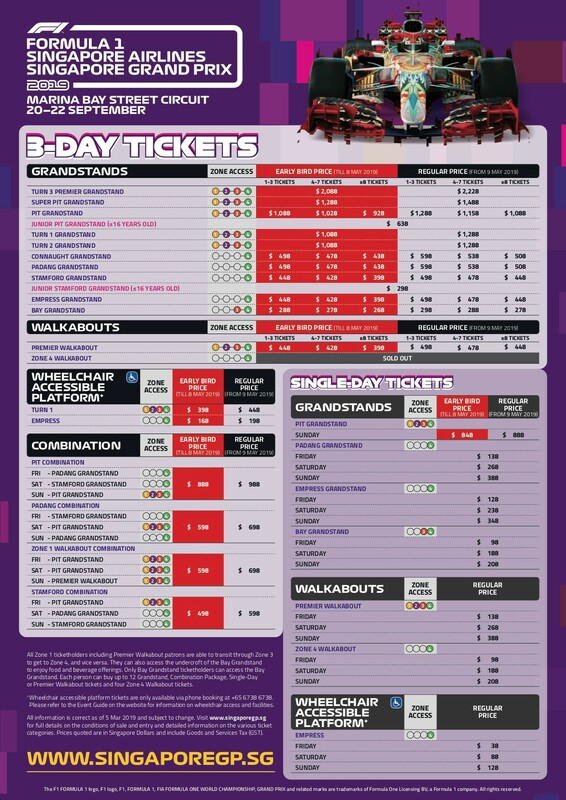 For more information or to purchase tickets, visit www.singaporegp.sg. 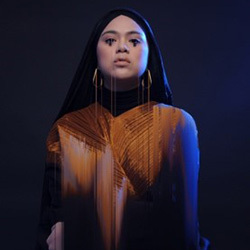 Tickets are also available via the hotline +65 6738 6738 as well as all authorised ticketing agents. Singapore has successfully hosted a decade of night racing and Asia’s only street race on the Formula 1® calendar in the Republic since 2008. The Formula 1 Singapore Grand Prix will continue to enthral crowds with its unique combination of night race action and world-class entertainment till 2021. See the world’s finest drivers go wheel-to-wheel under lights at speeds of up to 320km/h, threading the barriers around Singapore’s picturesque Marina Bay featuring a spectacular backdrop of iconic heritage buildings, modern architecture and a stunning skyline. 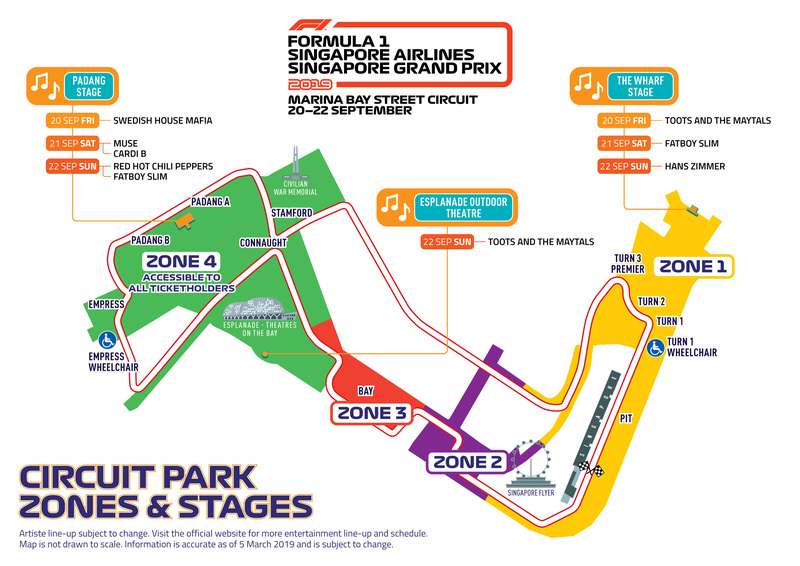 Annex A – Formula 1 Singapore Airlines Singapore Grand Prix 2019 entertainment line-up map overview (Zones and stages). For media kit and hi-res images, please visit bit.ly/SGPmedia. For the latest on #SingaporeGP, find us @F1nightrace on Facebook, Instagram and Twitter.